Now that the weather has gotten warmer, we are eating meals outdoors. While dining alfresco can be wonderful, it has it’s own challenges as well. If the wind blows or the pollen is falling, napkins can be sent all over the place. Who has time to wrap up utensils in napkins for entertaining? 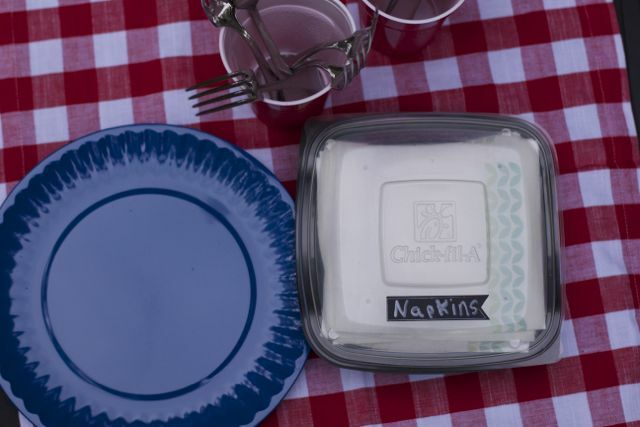 Well, I don’t always want to do this so we decided to up-cycle one of our Chick-fil-A salad containers and convert it to a napkin holder. 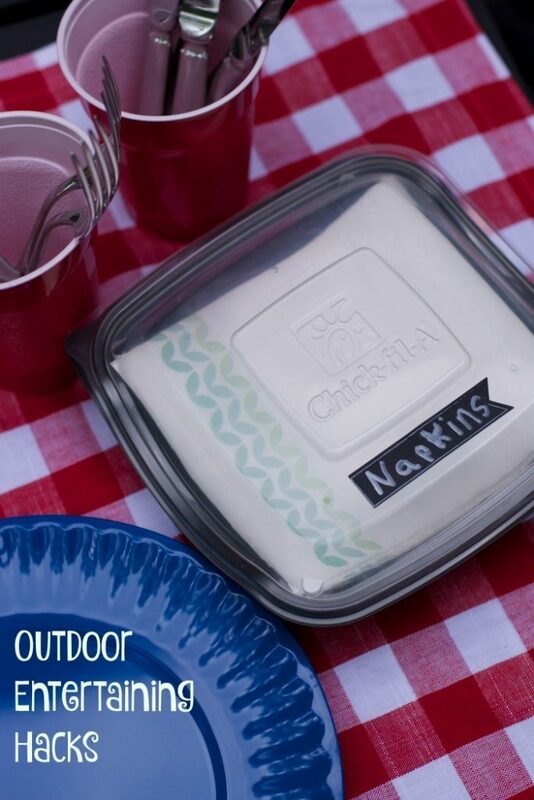 It is simple yet a practical way to keep your napkins on the table instead of flying across your deck or lawn. This post was made possible as part of my affiliation with Chick-fil-A Moms panel. I can’t wait to hear about your outdoor entertaining hacks to make outdoor entertaining pest free. The packaging is sturdy and has a fun wavy design so I could not just throw it away. I reuse containers for all sort of things like starting seeds, making terrariums and making vases. 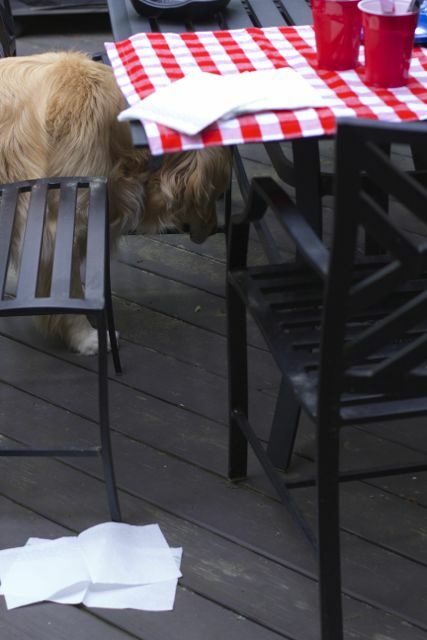 I started setting the deck for dinner and when I went back inside to grab a few more things, the napkins were flying everywhere. I immediately grabbed my Chick-fil-a container that was drying in my dish rack, and hoped my napkins would fit inside. I was so thrilled that my everyday napkins, and all my cocktail napkins would easily fit in this container. 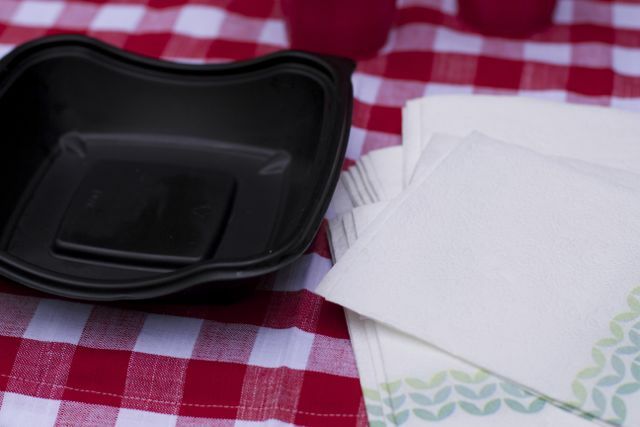 The lid will keep the napkins from flying all over the place and keep other outdoor elements like pollen or bird poop from dirtying up your napkins before you are ready to entertain outdoors. We added a fun label just incase people had no idea what was in there… I mean some people might just avoid opening it. Put cupcake liners over drinks and then put a straw thru it. What other Outdoor entertaining hacks can you share with us? Great idea! 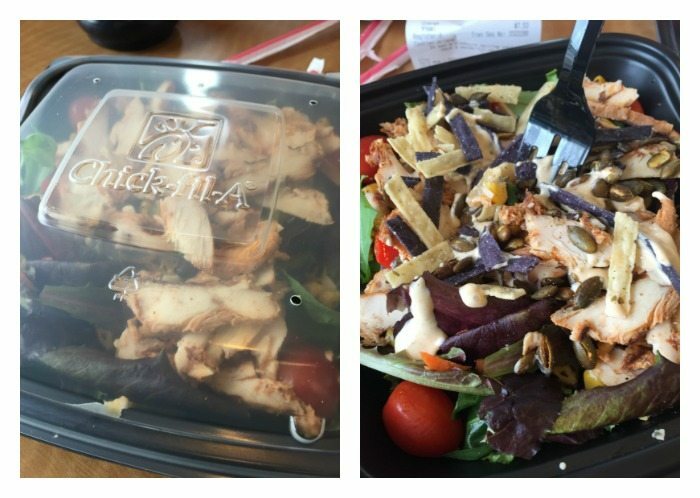 I love Chick-fil-a salads and their containers are perfect for reusing things. I like to use them for projects and holding items as well. I will have to remember to use one for napkins! 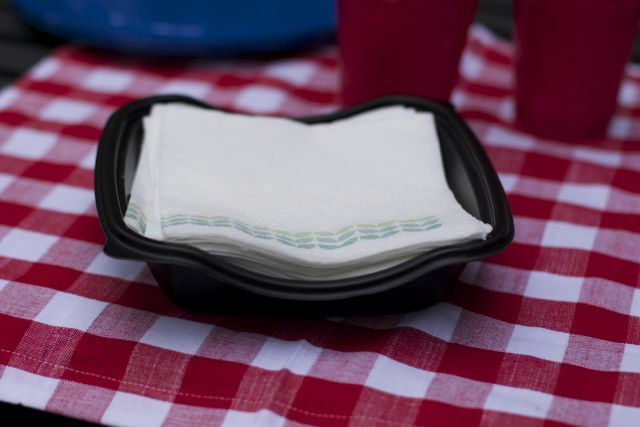 We have a lot of cookouts during the spring and summer and are always combating flying napkins and tipped over cups. These are some great hacks for a happier and more peaceful outdoor dining experience. 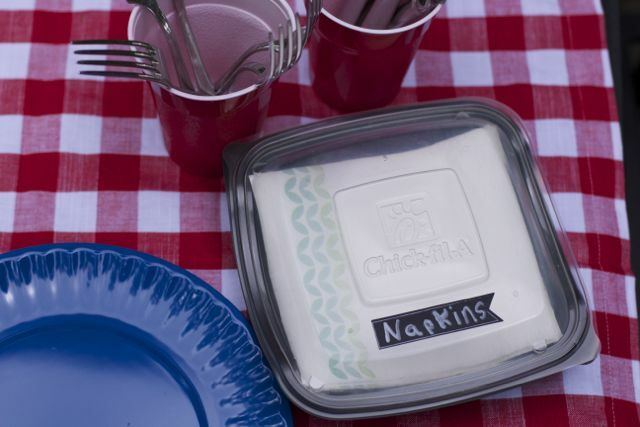 I love the idea of re-purposing take out containers for napkins. I take the kids on picnics all the time and I’m def. going to do this w/ the napkins. Omg now that is one cleaver napkin hack!!! I will be using this over the summer! I keep hoping that we will have a Chick-fil-a open up near us soon! 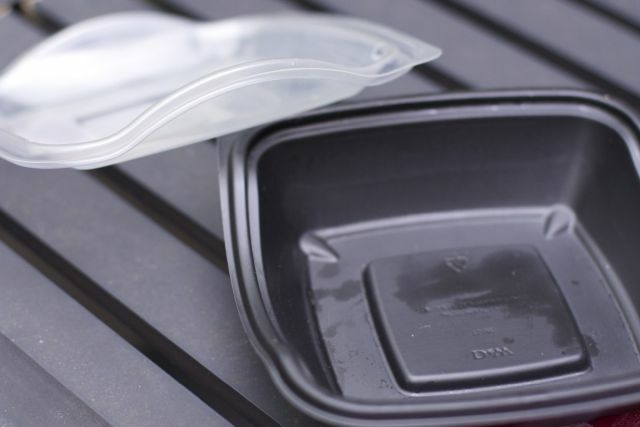 What a great way to reuse a take out container! Brilliant!!! I find that I love outdoor celebrations, but they can get hard to handle. I will have to try plastic plates… I always use paper and they can just be a HUGE mess! Thanks for the tips! The cupcake liner over drinks is a great idea I wouldn’t have thought of! That’s actually a really good idea! Totally great way of thinking about how to keep those napkins from blowing all over the place. I always have a problem with that we were in a picnic.